Algebra reverses the relative importance of the factors in ordinary language. It is essentially a written language, and it endeavors to exemplify in its written structures the patterns which it is its purpose to convey. The pattern of the marks on paper is a particular instance of the pattern to be conveyed to thought. The algebraic method is our best approach to the expression of necessity, by reason of its reduction of accident to the ghost-like character of the real variable. In Science and Philosophy (1948), 116. As regards railways, it is certain that nothing is so profitable, because nothing is so cheaply transported, as passenger traffic. Goods traffic, of whatsoever description, must be more or less costly. Every article conveyed by railway requires handling and conveyance beyond the limit of the railway stations; but passengers take care of themselves, and find their own way. From 'Railway System and its Results' (Jan 1856) read to the Institution of Civil Engineers, reprinted in Samuel Smiles, Life of George Stephenson (1857), 520. It gave me great pleasure to tell you about the mysteries with which physics confronts us. As a human being, one has been endowed with just enough intelligence to be able to see clearly how utterly inadequate that intelligence is when confronted with what exists. If such humility could be conveyed to everybody, the world of human activities would be more appealing. Letter (19 Sep 1932) replying to Queen Elizabeth of Belgium, in which she had complimented his lucid explanation of the casual and probabilistic theories in physics during a wander with her, in a park. As quoted in Albert Einstein, edited by Helen Dukas and Banesh Hoffman, Albert Einstein, The Human Side: Glimpses from His Archives (1979, 2013), 48. It is difficult even to attach a precise meaning to the term “scientific truth.” So different is the meaning of the word “truth” according to whether we are dealing with a fact of experience, a mathematical proposition or a scientific theory. “Religious truth” conveys nothing clear to me at all. From 'Scientific Truth' in Essays in Science (1934, 2004), 11. One of the hardest things in the world is to convey a meaning accurately from one mind to another. Letter to Miss Dora Abdy (1896). Quoted in Stuart Dodgson Collingwood, The Life and Letters of Lewis Carroll (1898), 331. One of the principal obstacles to the rapid diffusion of a new idea lies in the difficulty of finding suitable expression to convey its essential point to other minds. Words may have to be strained into a new sense, and scientific controversies constantly resolve themselves into differences about the meaning of words. On the other hand, a happy nomenclature has sometimes been more powerful than rigorous logic in allowing a new train of thought to be quickly and generally accepted. Opening Address to the Annual Meeting of the British Association by Prof. Arthur Schuster, in Nature (4 Aug 1892), 46, 325. Siphonophores do not convey the message–a favorite theme of unthinking romanticism–that nature is but one gigantic whole, all its parts intimately connected and interacting in some higher, ineffable harmony. Nature revels in boundaries and distinctions; we inhabit a universe of structure. But since our universe of structure has evolved historically, it must present us with fuzzy boundaries, where one kind of thing grades into another. Such is the character of mathematics in its profounder depths and in its higher and remoter zones that it is well nigh impossible to convey to one who has not devoted years to its exploration a just impression of the scope and magnitude of the existing body of the science. An imagination formed by other disciplines and accustomed to the interests of another field may scarcely receive suddenly an apocalyptic vision of that infinite interior world. But how amazing and how edifying were such a revelation, if it only could be made. In Lectures on Science, Philosophy and Art (1908), 6. The animals of the Burgess Shale are holy objects–in the unconventional sense that this word conveys in some cultures. We do not place them on pedestals and worship from afar. We climb mountains and dynamite hillsides to find them. We quarry them, split them, carve them, draw them, and dissect them, struggling to wrest their secrets. We vilify and curse them for their damnable intransigence. They are grubby little creatures of a sea floor 530 million years old, but we greet them with awe because they are the Old Ones, and they are trying to tell us something. The general knowledge of our author [Leonhard Euler] was more extensive than could well be expected, in one who had pursued, with such unremitting ardor, mathematics and astronomy as his favorite studies. He had made a very considerable progress in medical, botanical, and chemical science. What was still more extraordinary, he was an excellent scholar, and possessed in a high degree what is generally called erudition. He had attentively read the most eminent writers of ancient Rome; the civil and literary history of all ages and all nations was familiar to him; and foreigners, who were only acquainted with his works, were astonished to find in the conversation of a man, whose long life seemed solely occupied in mathematical and physical researches and discoveries, such an extensive acquaintance with the most interesting branches of literature. In this respect, no doubt, he was much indebted to an uncommon memory, which seemed to retain every idea that was conveyed to it, either from reading or from meditation. In Philosophical and Mathematical Dictionary (1815), 493-494. The propositions of mathematics have, therefore, the same unquestionable certainty which is typical of such propositions as “All bachelors are unmarried,” but they also share the complete lack of empirical content which is associated with that certainty: The propositions of mathematics are devoid of all factual content; they convey no information whatever on any empirical subject matter. From 'On the Nature of Mathematical Truth', collected in Carl Hempel and James H. Fetzer (ed. ), The Philosophy of Carl G. Hempel: Studies in Science, Explanation, and Rationality (2001), Chap. 1, 13. Also Carl Hempel, 'On the Nature of Mathematical Truth', collected in J.R. Newman (ed. ), The World of Mathematics (1956), Vol. 3, 1631. The reasoning of mathematicians is founded on certain and infallible principles. Every word they use conveys a determinate idea, and by accurate definitions they excite the same ideas in the mind of the reader that were in the mind of the writer. When they have defined the terms they intend to make use of, they premise a few axioms, or self-evident principles, that every one must assent to as soon as proposed. They then take for granted certain postulates, that no one can deny them, such as, that a right line may be drawn from any given point to another, and from these plain, simple principles they have raised most astonishing speculations, and proved the extent of the human mind to be more spacious and capacious than any other science. In Diary, Works (1850), Vol. 2, 21. 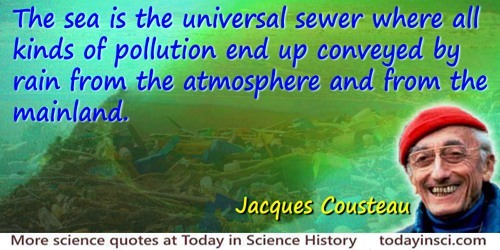 The sea is the universal sewer where all kinds of pollution end up conveyed by rain from the atmosphere and from the mainland. From Testimony, Third Plenary Session (28 Jan 1971), , Committee. In Panel on Science and Technology, Twelfth Meeting, International Science Policy, Proceedings before the Committee on Science and Astronautics, U.S. House of Representatives, Jan. 26, 27, and 28, 1971. No. 1 (1971), 325. The Senses place before us the Characters of the Book of Nature; but these convey no knowledge to us, till we have discovered the Alphabet by which they are to be read. In 'Aphorisms Concerning Ideas', The Philosophy of the Inductive Sciences (1840), Vol. 1, xvii.